Awards 2012 issue on sale now! | What Hi-Fi? Awards 2012 issue on sale now! Today's the day all our 2012 Award winners are revealed in all their glory. There are 100 Awards across 20 categories, the result of a year of testing and months of deliberation. If you want to know the best home cinema, hi-fi, TV and computer music products to buy, look no further. 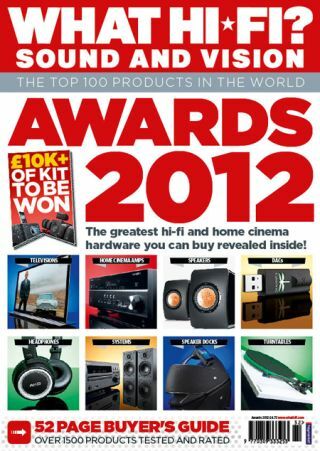 From the big stuff – TVs, home cinema amplifiers, speakers and hi-fi components – to those essential accessories to make the most of any system, it's all in our 2012 Awards issue, packed with new and exclusive tests and 100 Award-winners. Whether you want a basic TV or the latest hi-tech internet-connected 3D set, a simple home cinema in a box system or a complete set-up of Blu-ray player, receiver, speakers and a projector, we've Award-winners for you. And we're on-message with network music storage and streaming, too, with systems, streaming players, DACs and more to get your whole-house hi-fi up and running. It's our favourite issue of the year – the one for which our expert team of reviewers closes itself in our listening rooms for weeks on end and considers not only the brand-new arrivals in hi-fi and home cinema, but the long-established products those newcomers have to beat. We're flooded with all the hottest new products from the big names in consumer electronics, and the mood switches back and forth between serious deliberation to 'kids in the world's best sweetshop' – it's a blast for us, and we hope you agree with some of the products we've decided to crown best in class, and the best of the best. What's more, you could even win one of our chosen products in our £20,000 Awards competition. And if that's not good enough for you, we also have four sets of Dali Fazon 5 5.1 speakers packages up for grabs, each worth £1300. Want more Awards-related stuff? Click here, and you'll be transported to our dedicated Awards section of the site, where you can read all the reviews. And wherever you are in the world, don't forget you can download the digital edition of the Awards issue to your PC, laptop or tablet right now.